Tom Figel is a policy and regulatory manager focused on community solar for nonprofit GRID Alternatives, a national leader in making clean, affordable solar power and solar jobs accessible to low-income communities and communities of color. Cities are providing unprecedented leadership in the clean energy transition, using their purchasing power, ingenuity, and political leverage to advance renewable energy commitments and drive reduction in carbon emissions. As cities look for solutions to help meet their increasingly aggressive clean energy targets and support their local economies, community solar is a growing opportunity. Community Solar – distributed solar projects shared virtually by a number of subscribers in a community, typically through on-bill credits – is one of the fastest growing segments of the solar industry. The model offers a tremendous opportunity to develop clean energy resources in a way that benefits a broad swath of the population. Nearly three quarters of U.S. households can’t put solar on their roof, either because they rent or live in multi-unit buildings, and the 50 million low-to-moderate income families (who are more likely to reside in rental and multi-tenant housing) may face additional barriers like access to financing. Community solar is a flexible model that can open solar access to these market segments. To date, 19 states have enacted community solar policies, 12 of which include targets to ensure participation by low-income households. A recent vision study from GTM Research projected that community solar could grow to from about one GW today to 84 GW by 2030, serving nearly nine million new solar customers, including four million low-to-moderate income households, and amounting to $120 billion in capital investment. For cities, community solar is a way to vastly increase the amount of locally generated renewable energy, along with associated benefits of local jobs, property tax revenue, and local community investment. Other renewable energy strategies like purchasing Renewable Energy Credits (RECs), carbon trading and Virtual Power Purchase Agreements (VPPAs) may help cities meet their goals, but won’t drive investment and transition within communities or give cities a tool to address energy costs for low-income residents. Cities should keep community impact, investment, and equity in mind when choosing what to do with their energy purchasing power. Community solar scores high on all these counts. Directly including community solar targets, including equity goals and low-income participation commitments within their clean energy goals and advocacy. This may involve pushing for policy changes, negotiations with utilities, complex regulatory proceedings and more, or supporting solar industry groups like Vote Solar and the Coalition for Community Solar Access to make sure community solar is available to their communities. See www.lowincomesolar.org/community-solar for models and policy recommendations. Providing low or no-cost city-controlled land and rooftops, even landfills, for community solar projects with strong community or low-income impact goals. Participating in projects financially as “anchor” subscribers, typically through a power purchase agreement. Including job training and local hire provisions in contracts and programs. Directly supporting low-income resident participation through rebates or grants, or integrating community solar with city led low-income energy services. Setting targets for substantial energy bill reductions is also recommended. Serving as backstops or intermediary purchasers, developing loan loss reserves, or providing other innovative financing mechanisms to support participation of low-income residents. Colorado has the longest-standing community solar law on the books, so cities in that state are unsurprisingly leading the way on municipally-driven community solar. Among the best examples is Denver, where the Denver Housing Authority (DHA) has been a pioneer in community solar for multifamily affordable housing. In 2017, the housing authority developed a community solar project sited near the city that is serving a significant percentage of its affordable housing buildings and tenants, helping to reduce energy costs and providing revenue for increased tenant services, including a solar job training program. DHA plans to use community solar to serve their entire building stock; more than 11,000 units providing affordable housing to more than 26,000 very low, low and middle income individuals representing over 10,000 families and almost 15 MW of community solar capacity. The City of Denver is also working on an initiative to site a community solar project at its landfill, which will predominantly benefit low-income residents. The City of Fort Collins sited one of the nation’s first low-income dedicated community solar projects. The array, sited on the rooftop of a municipal building, is being used to expand the impact of the city’s energy assistance program by providing community solar and complementary energy efficiency services to reduce energy burden for all-electric customers. The City of Boulder is also supporting project siting by offering city rooftops and land for project development, subscribing to community solar projects as anchor finance partners, and offering solar rebates for low-income residents. In Texas, Austin and San Antonio have been pioneering municipal utility-led community solar models. Austin’s municipal utility Austin Energy developed a 2.5 MW community solar project, dedicated this past March, with half of the project’s capacity dedicated to low-income residents through the utility’s bill assistance program. 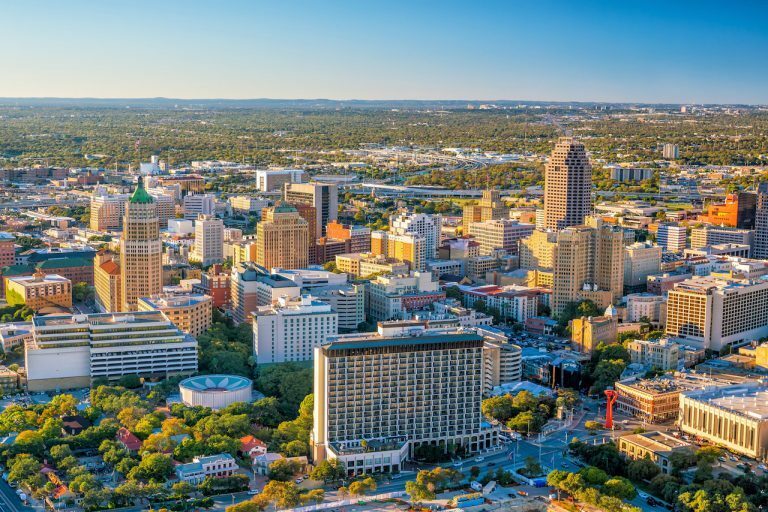 In San Antonio, Mayor Ron Nirenberg has made solar a priority and the city’s utility, CPS Energy is developing multiple community solar arrays that offer direct subscriptions with on-bill credits to customers. Unlike Austin, San Antonio’s community solar program does not currently include low-income targets or incentives. Washington D.C., although a relative newcomer, is one of the few cities that has fully integrated community solar into its 50 percent renewable portfolio standard (RPS). The RPS legislation, signed by Mayor Muriel Bowser in 2016, created the Solar for All program, which aims to cut electricity bills for 100,000 low-income residents in half by 2032. It also includes a city-wide solar job training program, Solar Works DC. The program’s ambitious goals will be met by a combination of single-family, multifamily and community solar, with much of the community solar to be sited on buildings within city limits. The city is providing incentives, siting support and grants as part of the effort, which is just getting underway. Efforts like these that center local energy resources and economic development in a broader renewable energy goal are a model for cities of the future. They require enabling state and federal policy, local political will, community engagement and buy-in, and public and private dollars. The return on investment is substantial: an opportunity to support an equitable, sustainable clean energy transition within cities, inclusive of our most energy-burdened communities. Cities are already doubling down on their commitments to lead the clean energy transition. Community solar – solar in and for the benefit of the community – should be a central part of their strategy. It is convenient to migrate from fossil energy to solar energy in conjunction with wind, since for countries like ours we would be more expensive with accumulators, the barrier to jump would be the same government and the traditional company in the sector.